Custom Android application development is an attractive service that we offer because the Android platform is used by over 1 billion active users around the world. If your company needs to reach a wide, diverse audience positioned across the globe, then our Android app development services could be perfect for you. Develop your mobile app with us:- Nakshatra Technology is a mobile app development company. We offers app services to our clients, which includes rich features and advanced functionality. 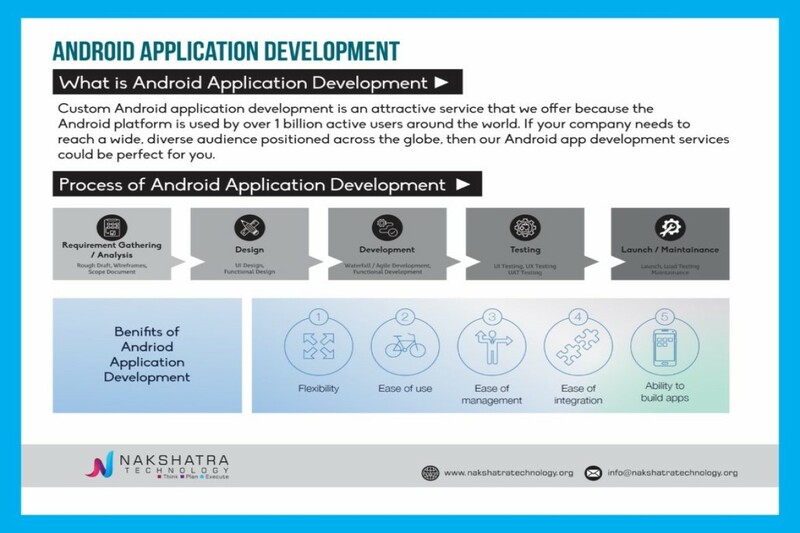 Nakshatra mobile app developers work in depth strategy to designing & development. We provide best mobile applications to our customers for their business to transform your business into profitability. Nakshatra believe to develop the delightful and powerful mobility solution for android, iPhone, iPad, Android, and Windows. We have developed 100+ mobility solutions on various platform across the industry and served it globally.